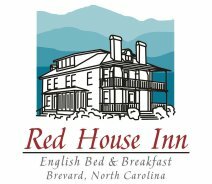 The newly renovated Red House Inn provides comfortable bed and breakfast accommodation in downtown Brevard, NC. The Inn is a short walk from many shopping and dining opportunities and within easy driving distance to Brevard Music Center, Pisgah National Forest and Dupont State forest. It is ideally situated for exploring the North Carolina mountains, visiting waterfalls, hiking, mountain biking and fishing.